Guillaume Mercure, a coach specialized in physical preparation for combat sports for three years. A former international fighter in French boxing and karate, he decided to coach and mentor athletes wishing to participate in a martial art competition. He has helped a close friend prepare for karate competitions. He is founder and head coach at Savate Club L'Escouade since September 2011. He is a part-time student in kinesiology at the University of Montreal. He is a savate teacher and physical trainer specializing in martial arts and combat sports. He started karate at UQAM under the banner of sensei Alain Bujold and sensei Jean-Guy Girouard (and later with Shihan Donald York) with whom he obtained his black belt in the style shorinjiryu kentokukan in 2002 and the 2nd dan In 2005. Before turning to savate, he taught karate at UQAM, Dawson College and Tristar Gym while competing in Canada and the United States. He also taught Savate at McGill University, the Savate AMF Club, the Claude-Robillard Center, the Père-Sablon Center and the Center du Plateau. In 2005, he began the Savate at Concordia University with Raphael F. Estevao. In 2009, he met Lilian Guicherd-Callin who helped me to perfect my knowledge of savate. Subsequently, he took part in the world championship in Paris in 2010. In the spring of 2011, he successfully completed Level 1 instructor training with Lilian Guicherd-Callin. In September 2011, he inherited the club of Savate AMF from Professor Lilian Guicherd-Callin. He moved the club to the Père-Sablon Center and decided to rename it the savate club L'Escouade. He worked at Énergie Cardio, at the Tristar Gym and at the Gym Ben Weider at the Père-Sablon Center as a private trainer where he coached all kinds of clients including martial arts athletes. In January 2012, he opened a branch of the club at the Center du Plateau on St-Joseph Street, which was taken over by Stéphane Hidrot and Arnaud Morin. 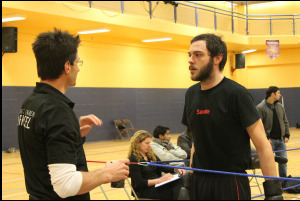 In addition, it is helping two savate clubs grow to promote savate in Quebec and Ontario. He worked for the Sûreté du Québec while continuing his studies and training in the National Coaching Certification Program. He has been practicing martial arts for nearly 19 years. He also holds a bachelor's degree in history and has written a book entitled "Karate: The Development and Export of a Martial Culture of Okinawa". 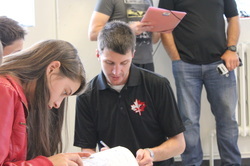 He assumed the position of Assistant Coach for the Canadian Assault Assault Team for the 2014 World Championship in Rome (October). In May 2015, he passed his yellow glove (a kind of black belt) with his partner Josh Murray. Guillaume is working on a French boxing savate instructor's manual and a book on the history of the savate. Josh Murray is a former member of the Canadian team and former Canadian savate champion. He began to teach in the club the Escouade since its creation. He was part of the coaching team for the 2010 World Championships. This training biochemist is also a judge in high quality competition. Josh passed his yellow glove test in May 2015. He is a judge and referee for Savate Canada. ﻿Tommy Pochat started the savate in Brittany, France in the 1980s. He made numerous competitions before hanging his gloves. He possesses the highest grade in savate which is the silver glove. Following his immigration to Quebec, he decided to take back the savate at the club of Lilian Guicherd-Callin and began teaching in the savate club L'Escouade. Tommy is involved as referee and judge in the competition. Louis-Philippe Garceau has been practicing savate for 3 years in the club of Savate L'Escouade. He quickly entered the world of competition by participating in numerous galas and the 2014 and 2015 Canadian championships. He has a master's degree in philosophy and is very interested in cinema. Louis-Philippe is a savate red glove and assistant instructor for the club. He owns the national certificate of French boxing savate level 1 passed on September 9, 2015. 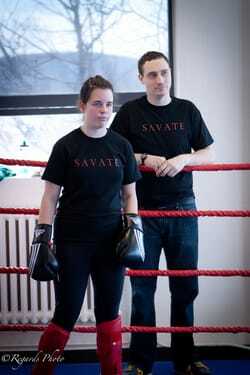 Jessica Giguère began the savate at UQAM with Professor Maxime Nadon. After taking a break, she resumed training with Guillaume Mercure. She competed in many competitions and at the Canadian championships in 2014 to become the lightweight champion. She participated in the world championship in Rome in 2014. Jessica impressed with victories against an English and a Russian who had much more experience. She is a red glove and teaches occasionally in the club and in her own room once a week. She holds the national certificate of savate boxing level 1 on September 9, 2015. She is currently Treasurer of Savate Canada.